All our experience in web promotion at your service. We offer targeted solutions to get more customers for your restaurant web site. We make responsive web site for restaurant by implementing technical troubleshooting so that it can be easily readable and then indexable by search engines. 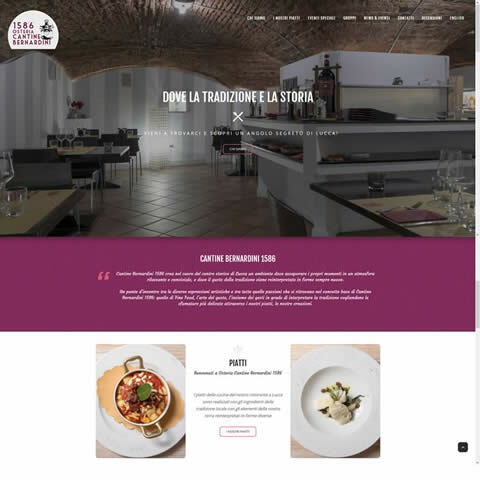 In our web site building package we always include a Backoffice platform from which you can manage the content on the site that will allow you to independently update your proposals (menus, offers, events) and thus make the visitor interaction a unique experience. The back office system we own is tailored to your needs and is easy to use. We also implement table booking solutions with instant confirmation of availability. The graphic aspect of the website will be tailored to your reality by adding JQuery animations (slide images, photogallery) that make it all the more modern and captivating, and in any case always in line with the latest web solutions. Follow strict guidelines in building a website for your restaurant by turning to web professions to avoid giving your business a realistic image. Spending on a website is like losing potential customers, it's important that doing it is a professional, do it yourself could be a huge waste of time and probably also of customers. Let your restaurant know about the web and get new customers: CONTACT US FOR A FREE PRICE.